We planned out our days pretty full on this trip, but today was probably the busiest. First stop: pick up our tickets to tour Neuschwanstein. Hohenschwangau, King Ludwig's childhood home, was just up the hill from the ticket office. 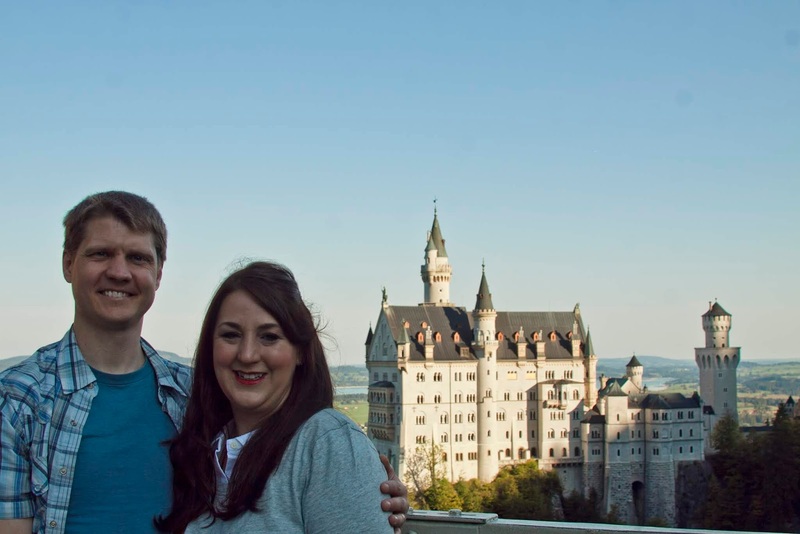 But we had our sights on King Ludwig's opulent Neuschwanstein Castle. The walk up the mountain was a scenic hike through the forest. Most of our group needed to stop and rest along the way. The restaurant Zur Neven Burg along our path up to the castle. No wonder Neuschwanstein inspired Cinderella's Castle. Neuschwanstein towers over the countryside far below. We continued along the path past Neuschwanstein to get a better view from the other side. This marked the spot where we turned left toward the bridge Marienbrücke. View of Marienbrücke from the castle. And our view of Neuschwanstein from the bridge. Inside the castle is simply gorgeous. King Ludwig was a young, introverted king who only cared about building expensive palaces for himself rather than ruling Germany. But inside is breathtaking. The interior just exudes wealth. 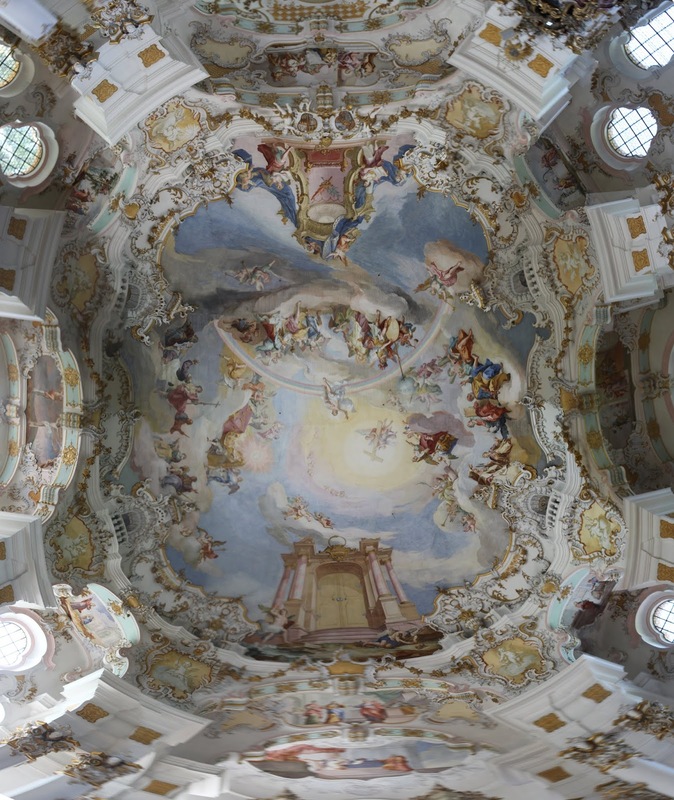 I especially love the paintings on the walls: dedicated to the composer Wagner, depicting scenes from his operas. They did not allow photography inside, but here's an example of what it was like. 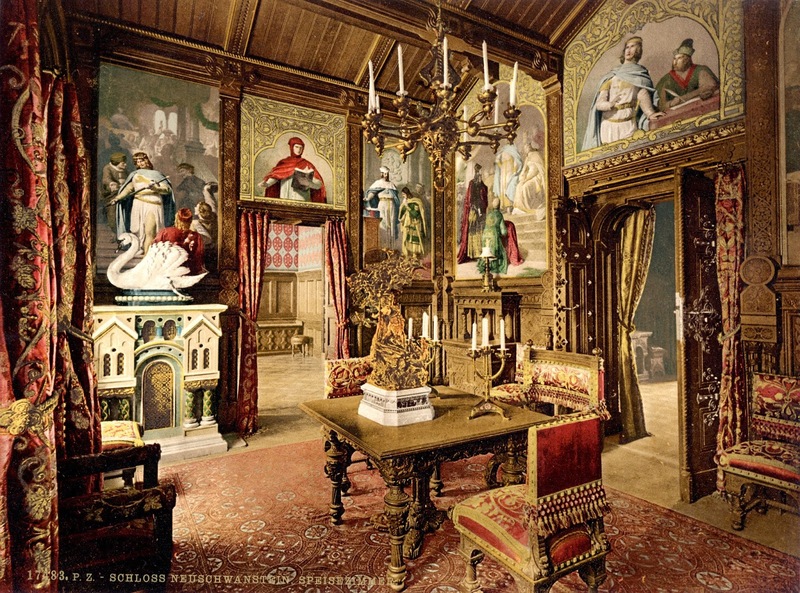 King Ludwig only stayed a total of 172 days in Neuschwanstein. On the hike back down the mountain we stopped off at Zur Neven Burg for lunch. A man in lederhosen down by the ticket office. From Neuschwanstein we drove out to see Weis Kirche. 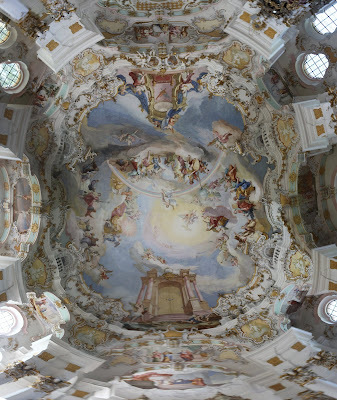 Staring up at the painted ceiling. Jeni was pretty excited to see cows. 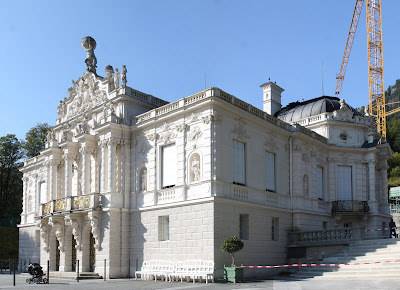 Off to King Ludwig's Linderhof Palace, the only palace he fully completed and spent most of his time in: about 7 years total. View of the grounds from the front of the palace. I love this little garden off to the side of the palace. King Ludwig was a young king who was more interested in building exquisite palaces than in ruling his kingdom. Ludwig didn't have guests over but merely hid himself away at his palaces, away from everyone. 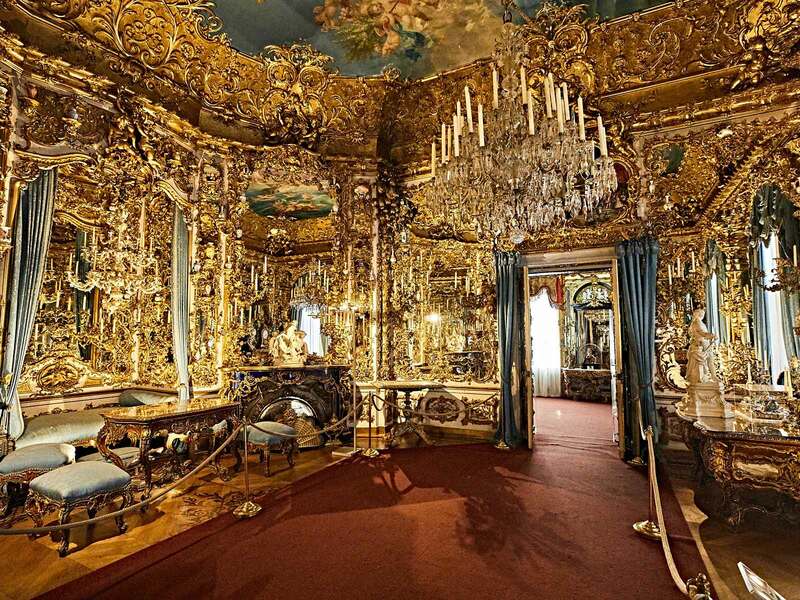 None of his palaces have any paintings or sculptures of himself. 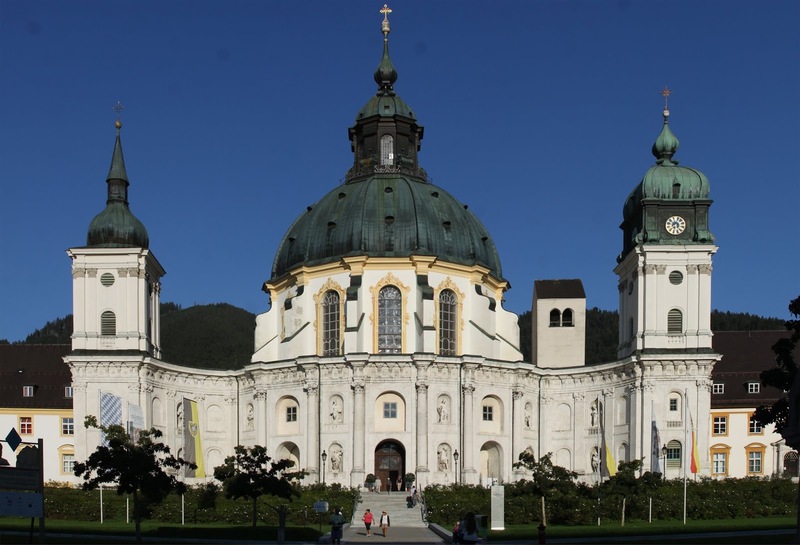 Where Neuschwanstein was filled with Wagner paintings, Linderhof is filled with images of King Louis XIV of France. They don't allow photography inside but it's super fancy. Like as golden and opulent as Neuschwanstein but all condensed down to just a few rooms so that every square inch is simply over-the-top, mainly in gold. To end the day we stopped off at Ettal Abbey. Here's the Basilica. Just as they were closing the cheese shop we stopped in and bought some cheese. We had a 2.5 hr drive to Tiesendorf where we stayed the night (and we were running late) so we had to skip dinner and hit the road. Gillian was pretty grumpy about it but hey, such is life. Oh, Jeni is keeping her eyes open for a dirndl for Hailey. We'll be in Salzburg tomorrow so maybe we'll pick one up then. Our home for the next 3 nights. Gillian and Jeni loved visiting the cows.